It was 1st July 1948 in the Year of the Earth-Ox when an auspicious birth took place in Kham, Tibet. His Eminence Zasep Tulku Rinpoche, the 13th incarnation of Lama Konchog Tenzin of Zuru Monastery, was born as prophesied by Jetrung Rinpoche to a father born in the Tiger year and a mother in the Bird year. His father’s name was Karma Dugdak and his mother was Paltso. Paltso had many auspicious dreams when she was pregnant with him and his birth was painless. The family also had very auspicious dreams, and the whole of Gerjel province had a fine year with no pestilence or disease and good seasonal weather. 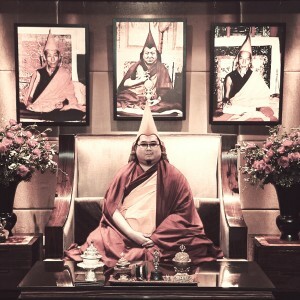 The high Kagyu, Sakya and Gelug lamas recognised Zasep Rinpoche when he was born, acknowledging all the signs of an extraordinary being entering the world. 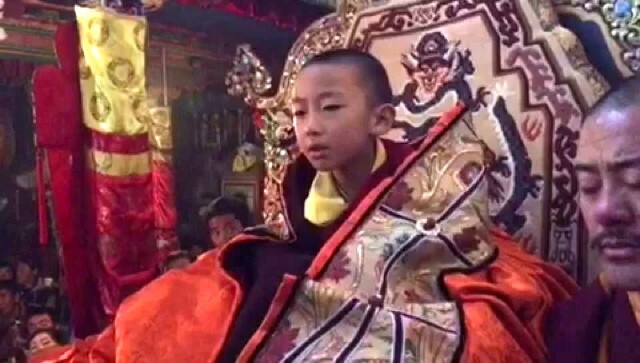 In 1953, at the tender age of five, the young boy was taken to Zuru Gompa where he was enthroned with great ceremony and received the robes, hats and bowl of his previous incarnation. Thousands thronged to meet and make offerings to the young tulku. He stayed in Zuru Gompa for two years where he learnt the Tibetan alphabet and the many daily prayers of Zuru and Tunzhi. He is said to have liked to read the One Thousand Songs of Milarepa (Mila Gurbung) and the Sutra of Great Liberation (Tharpa Chenpodo). 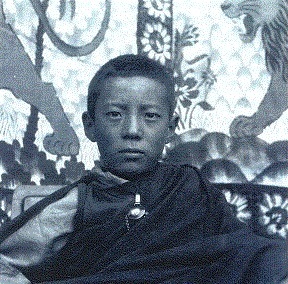 When he was seven, Zasep Rinpoche visited his parents and the people of his village. His family invited his uncle, a renowned Kagyupa teacher who had meditated in seclusion for 19 years, to his home to meet him. 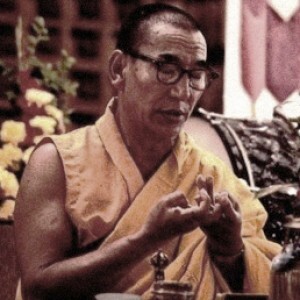 From this holy lama, the Venerable Sachyu Rinpoche, Zasep Rinpoche received the Amitayus long life and Tara initiations. Zasep Rinpoche’s grandfather then brought him to study in Tashi Lhapug Gompa, the largest Gelug monastery in the area, with approximately 700 monks. 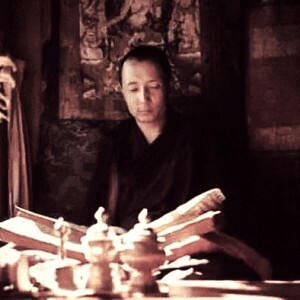 There, he studied, meditated and received the Yamantaka initiation from the great Bodhisattva Lama Lodro Dragpa. He also took the Eight Precepts and robes from a Gelug lama named Chonjor Gyaltso and received the name Jamyang Thubten Lodro. 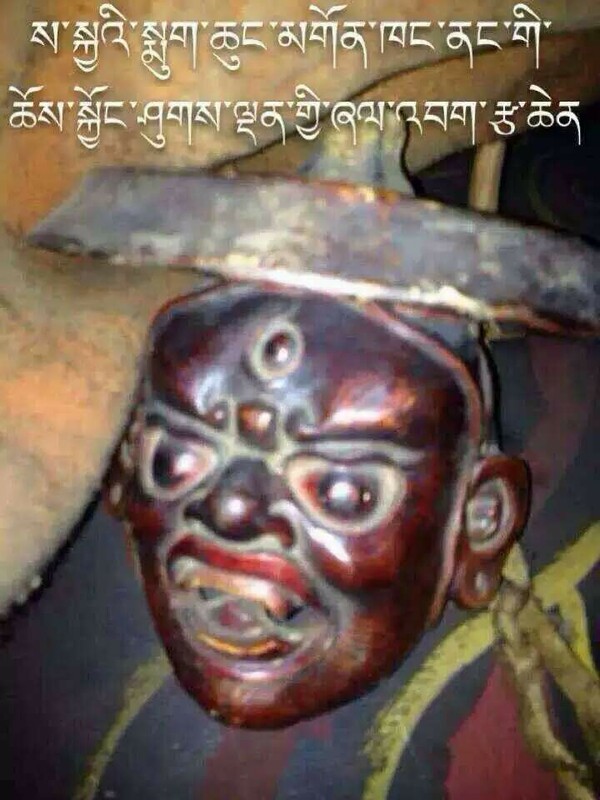 Chonjor Gyaltso was a mahasiddha who was a disciple of the incomparable Kyabje Pabongka Dechen Nyingpo. 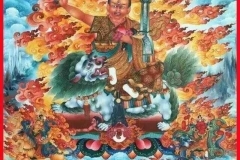 He was also the oracle of Kalarupa (Damchen Chogyal), the Dharma Protector of the Gelugpa lineage, had completed the 108 cemetery meditations and had meditated by 108 springs to benefit the cemetery beings and nagas. At the request of the monks of Zuru Gompa, Zasep Rinpoche returned and was taught by the Kagyu Lama Trinlay Konchob. 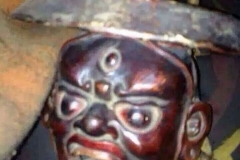 From Geshe Tsegyam, a Kagyupa monk from Sera Monastery, he received teachings on Je Tsongkhapa’s Lam Rim. In Lhasa, Zasep Rinpoche met His Holiness Kyabje Trijang Rinpoche, who through his clairvoyance, immediately recognised Zasep Rinpoche as the incarnation of Konchog Gyurme and suggested that he attend Sera Monastic University to further his studies and learn Madhyamika philosophy. 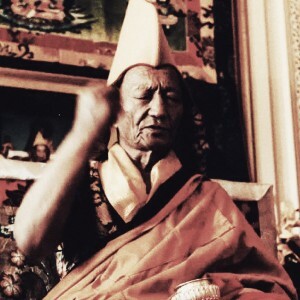 Upon his arrival at Sera, Zasep Rinpoche entered Sera Jey Dratsang where he was installed as a lama and received teachings on Pramanavatika by Dharmakirti from Geshe Jampa Chogdup. 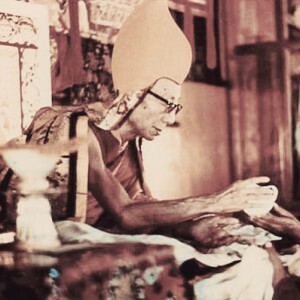 In 1958, Sera Ngapa Dratsang (the Tantric College) invited Kyabje Trijang Rinpoche to give initiations. 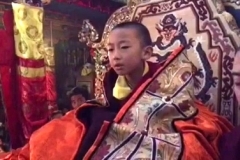 Although he was only 10 years old, Zasep Rinpoche received Guhyasamaja Akshobhya Vajra, Heruka Tilbu Lhanga, Thirteen Deities of Yamantaka, and Kunrig Yoga Tantra initiations from Kyabje Trijang Rinpoche. 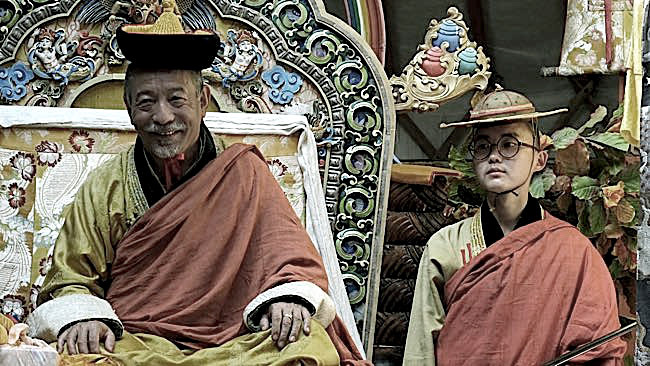 At the end of that year, Zasep Rinpoche went on a six-month pilgrimage and visited Tashi Lhunpo Monastery, Sakya Monastery and Tingri Langkor, the temple of Padampa Sangye who is the lineage holder of Chöd practice and the Guru of Machig Labdron. 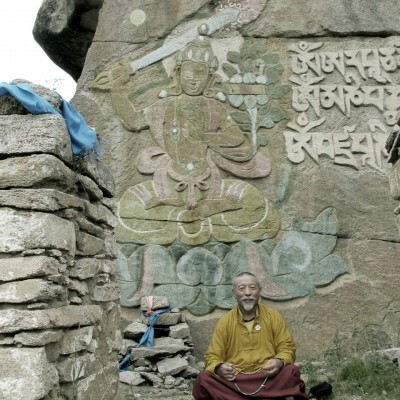 Zasep Rinpoche and his entourage then went to Mount Kailash where he entered a two month retreat of Ngondro (preliminary practices) which included prostrations and Migtsema recitations. He also visited three of Milarepa’s caves – Zurtrul Pug (Manifestation Cave), Dra Pug (Yak Horn Cave), and Choku Pug (Dharmakaya Cave) before he returned to Sera. 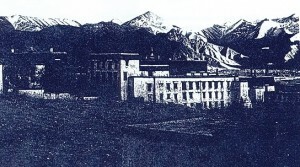 During the invasion of Lhasa about three months later, Zasep Rinpoche escaped from Sera by walking in the shadows of the night across the monolithic mountain range between Lhasa and Penpo. He stopped over at Nalanda Gompa for two days before continuing on horseback across the great western grass plains of Tibet with only a few possessions and a tent, running without food for many days. They travelled day and night to cross the Nepalese border at Mustang, into freedom. Zasep Rinpoche stayed at the holy pilgrimage town of Muktinath on Mustang’s border for three months to engage in another set of Ngondro practices and a Guru Yoga retreat. It was here that the Chinese caught Rinpoche’s father and Rinpoche’s mother passed away from an illness. Zasep Rinpoche then went to Kathmandu to visit the three great stupas of Swayambhunath, Boudhanath and Namo Buddha. At Pharping, the holy place of Vajrayogini and Padmasambhava, he made more prostrations and mandala offerings. He also did a five-month Vajrasattva and Guru Yoga retreat in the small Nepalese village behind the Great Stupa of Boudhanath. 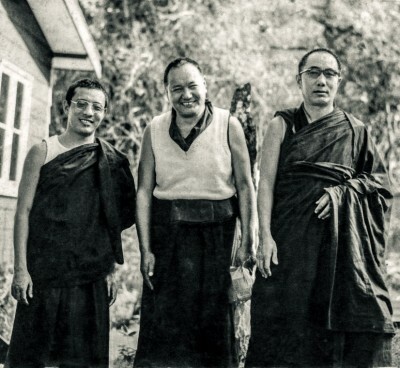 In 1961, Zasep Rinpoche arrived in Dharamsala, where he met Kyabje Trijang Rinpoche and Kyabje Ling Rinpoche once again. He received getsul (novice monk) ordination from Kyabje Trijang Rinpoche in the same year. Wishing to go even deeper into his practice, Zasep Rinpoche sought advice from Kyabje Trijang Rinpoche, who told him to further his Sutra and Tantra studies with Geshe Thubten Wanggyel, a highly realised master who lived the life of an ascetic in Dalhousie in the high Himalayas. 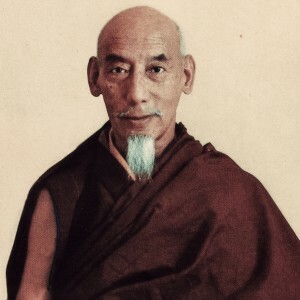 Upon hearing the name of this great teacher, Zasep Rinpoche felt a great happiness due to the strong karmic connection between them. I’m honored to accept you as my student because my root Guru Trijang Dorjechang sent you to me. Trijang Dorjechang knows that we will develop good teacher and student relationship. 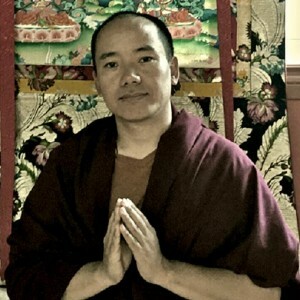 Zasep Rinpoche embarked upon ten years of intensive meditation and study with Geshe Thubten Wanggyel and during that time received teachings on the Pramanavatika, Prajnaparamita, Madhyamika, Abhidharma, Vinaya and Tsongkhapa’s Lam Rim. He also received many profound Tantric teachings. Almost every winter for ten years, Zasep Rinpoche did a four-month retreat with his teacher in the mountains above Dalhousie. He and his guru lived in an old colonial English cottage called Bright View, from which they could see the whole Himalayan chain. Sometimes the snow against the cottage was eight feet deep and they couldn’t open the door in the morning. Zasep Rinpoche did Lam Rim, Bodhicitta and Shunyata retreats as well as Chenrezig, Tara, Vajrayogini, Yamantaka and other daily retreats. 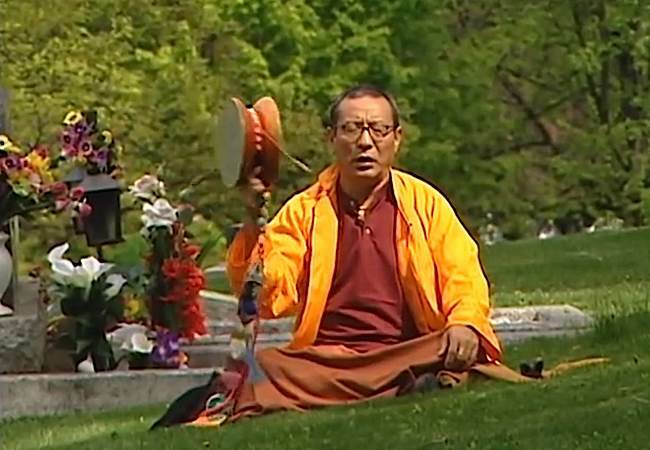 During the summer, Zasep Rinpoche received teachings on five different texts simultaneously. At night, he meditated and recited sadhanas with Geshe Wanggyel. 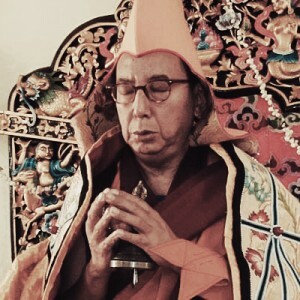 Having been taught a technique of quiescence and concentration meditation one day, Zasep Rinpoche would be questioned the following day about his meditation experience. If his answer was not satisfactory, Geshela would asked him to practise more and more. Geshela was wrathful and a very strict teacher. One evening Zasep Rinpoche was very tired and as he was meditating in front of Geshela, he started to nod off to sleep. 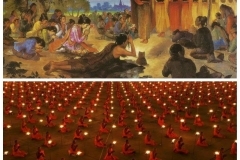 Geshela picked up a small mud butter lamp, his daily offering to the Three Jewels, and threw it at Zasep Rinpoche. The lamp hit his head and broke into many pieces. 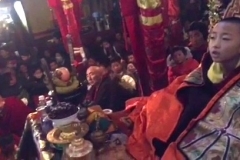 Zasep Rinpoche wrapped his upper robe around his injured head to stop the bleeding. Seeing this, Geshela beat him and kicked him out of the house. 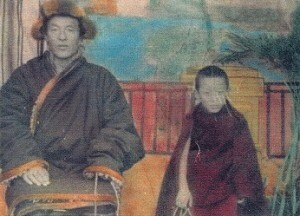 With his great devotion to his teacher, Zasep Rinpoche took his teacher’s harsh treatment as a blessing and initiation. 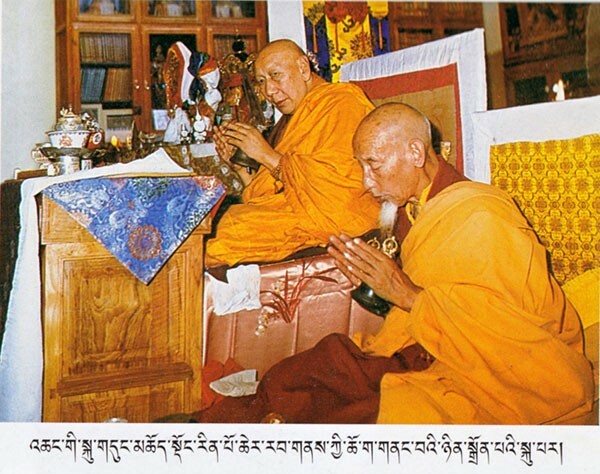 Early the next morning, Zasep Rinpoche returned to Geshela’s house and made prostrations before him. Geshela laughed for minutes, then patted Zasep Rinpoche on the head and gave him his old mala (rosary) as a blessing. That whole day, Zasep Rinpoche was especially happy; his meditations were good and he realised that his teacher had helped him to quickly purify much bad karma. He understood that these beatings were only for his own benefit, and although they caused physical pain, they never made him unhappy. After overcoming many physical difficulties and mental hindrances with enthusiasm and calm perseverance, your mind will naturally open, revealing its inner radiance, just as the Blue Lotus which remains closed by the pale light of the moon opens as the sun rises to reveal its true beauty and splendor. Zasep Rinpoche received extensive teachings and initiations from many erudite great masters. 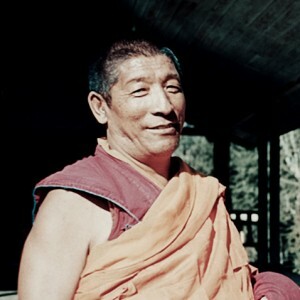 In 1964, he received Guhyasamaja initiations from Kyabje Trijang Rinpoche. 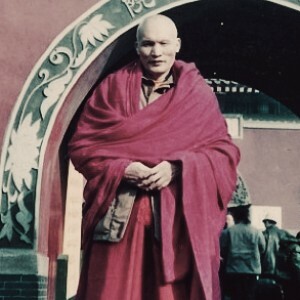 In 1965, he received Lam Rim teachings, Bodhicitta Thought Training, Eight-Verse Training of the Mind, Thirty-Seven Practices of the Bodhisattvas by Thogmed Zangpo, and Atisha’s Lam Rim. He also received the complete Lama Chopa, and Vajrasattva initiation and teachings. In 1966, he received the complete set of Heruka five deities and body mandala initiations and teachings. He received all the Vajrayogini initiations and teachings several times and transmissions, and the set of Twenty-One Taras initiation as well as Chenrezig initiation, and initiations of Amitayus and White Heruka for Long Life. Rinpoche also received very special teachings on the uncommon inconceivable yoga practice of Vajrayogini. This teaching is only given to three students at one time. Rinpoche alone received this teaching when he was about 18. In 1966, Zasep Rinpoche received the transmission of the complete works of Lama Tsongkhapa on Sutra and Tantra, the four volumes of Gyaltsab-je, a disciple of Tsongkhapa and the eight volumes of Kadruje and the transmission of Getongpa (Prajnaparamita in 8,000 verses) from Pangnang Rinpoche. He also received the complete Guhyasamaja initiations, commentary and transmission of the Guhyasamaja root text (Sri Guhyasamajamahatantraraja) and Six-Armed Mahakala initiation. In 1968, he received the complete teachings on the Lam Rim Chenmo and teachings on Gaden Lhagyama with commentary by the 7th Dalai Lama, and he received gelong ordination (complete monk’s ordination) that same year. At Bodhgaya in 1969, he received Lam Rim Chenmo teachings and White Tara initiation. 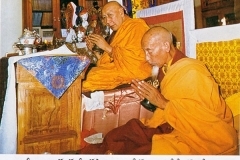 In 1970, he received the Kalachakra initiation and again received teachings on Lam Rim Chenmo. 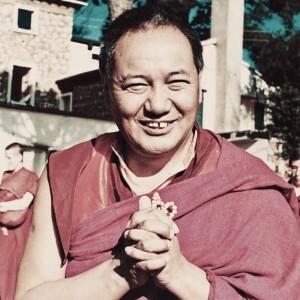 In 1971, he received the complete Lama Chopa (Guru Yoga) teachings and teachings on the Mahamudra root text with commentary by the 2nd Panchen Rinpoche. 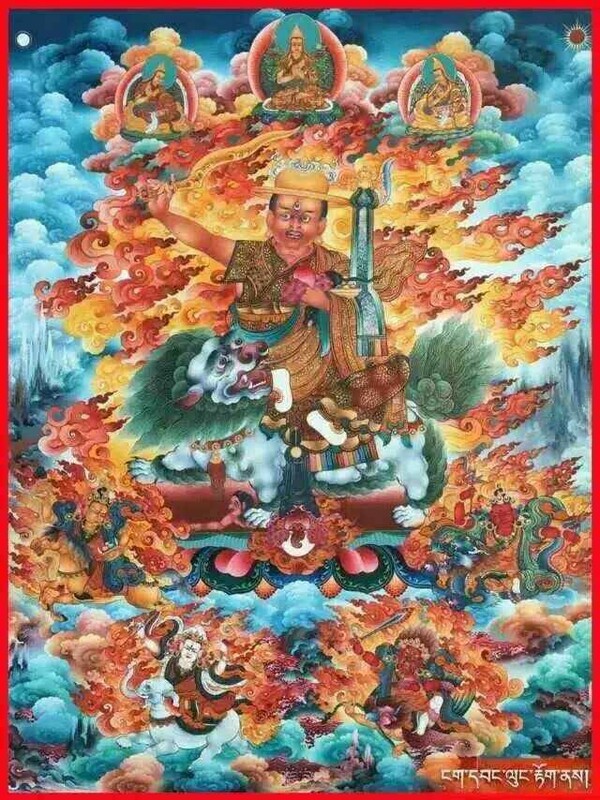 In 1972, he received the complete Lama Chopa teachings and the initiations of Amitayus, Chenrezig, Vajrayogini, Guhyasamaja, Hayagriva, King Garuda and Vajrapani. He also received commentaries on Lojong and Samayavajra. In 1973, he again received the Kalachakra initiation and the Chenrezig Wangchen. From His Holiness Kyabje Zong Rinpoche, he received the initiations of Chakrasamvara Five Deities and Body Mandala, Vajrayogini, Cittamani Tara and Chöd, commentaries on Cittamani Tara, Chöd according to the Gaden Ear Whispered Lineage and the Six Yogas of Naropa according to Lama Tsongkhapa. 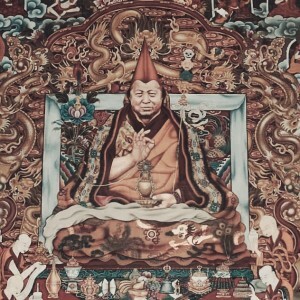 From Kyabje Ling Rinpoche he received all the Yamantaka initiations and teachings on the commentaries as well as transmission of the Yamantaka Tantra root text. He also received Gaden Lhagyama teachings. From Tara Rinpoche, he received initiations of Hayagriva Sangdrup, Guhyasamaja, Vajrasattva, White Manjushri and Six-Armed Mahakala. He received the initiations of Chakrasamvara Five Deities and Body Mandala, Orange Manjushri, Medicine Buddha, White Heruka, Goddess Saraswati and Dharmapala Setrap Chen from the great Kyabje Lati Rinpoche. From Ven. 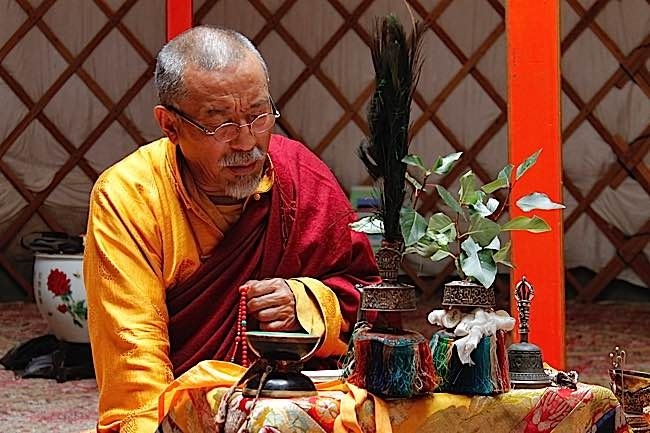 Khalkha Jetsun Dampa Rinpoche, he received Chöd initiations and teachings of the Gelug tradition, initiations of Chöd according to the Gaden Ear Whispered Lineage and Dakini Ear Whispered Lineage, initiation of Chöd according to the Kagyu Lineage and Kurukulle initiation. Zasep Rinpoche also received a very rare and sacred teaching, The combination practice of peaceful and wrathful Manjushri (Tib. Jamyang Zhe Tro Drag Drup Thun Moomg Ma Yin Pa.) Not many people know about this teaching and only a few lamas have received it. According to the Gelug tradition, one has to wait for three years, three months and three days before this request to receive the teaching is granted. Each year, a new request must be made. Five Lamas made this request to Kyabje Ling Rinpoche and they were Zasep Rinpoche, his teacher Geshe Thupten Wanggyel, Ven. 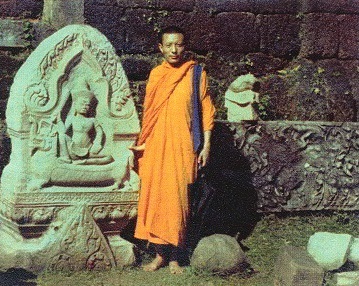 Sha Ko Ken Rinpoche, Ven. Ja Moon Rinpoche and Ven. Jhampa Kelsang Rinpoche. After three years, three months and three days of waiting, a letter arrived from Kyabje Ling Rinpoche granting their requests and the five Lamas traveled to Dharamsala from Dalhousie for the teaching which lasted less than three hours. Kyabje Ling Rinpoche also kindly lent them his own text to copy by hand as the sacred text cannot be reproduced nor published. 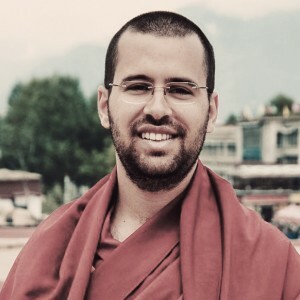 In 1972, Geshe Wanggyel advised his devoted student, Zasep Rinpoche to further his studies in Pramana and Madhyamika philosophies at the Varanasi Sanskrit University. 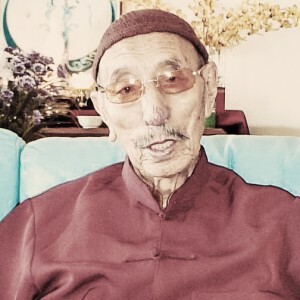 As Zasep Rinpoche was departing, his loving and kind teacher gave him his copy of the Lam Rim Chenmo and told him that they could now no longer remain together. 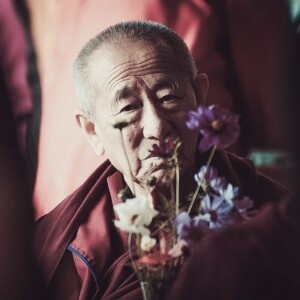 After three months in Varanasi, Zasep Rinpoche received the sad news that his beloved Guru had passed away, early one morning after doing the Vajrayogini self-initiation with some of his students. Geshela’s body remained in the meditation posture for three days, radiating with beautiful energy, in the state of clear light and bliss. As advised by his teacher, Zasep Rinpoche continued his studies in Varanasi Sanskrit University for three years where he received his Acharya (Master’s) degree. 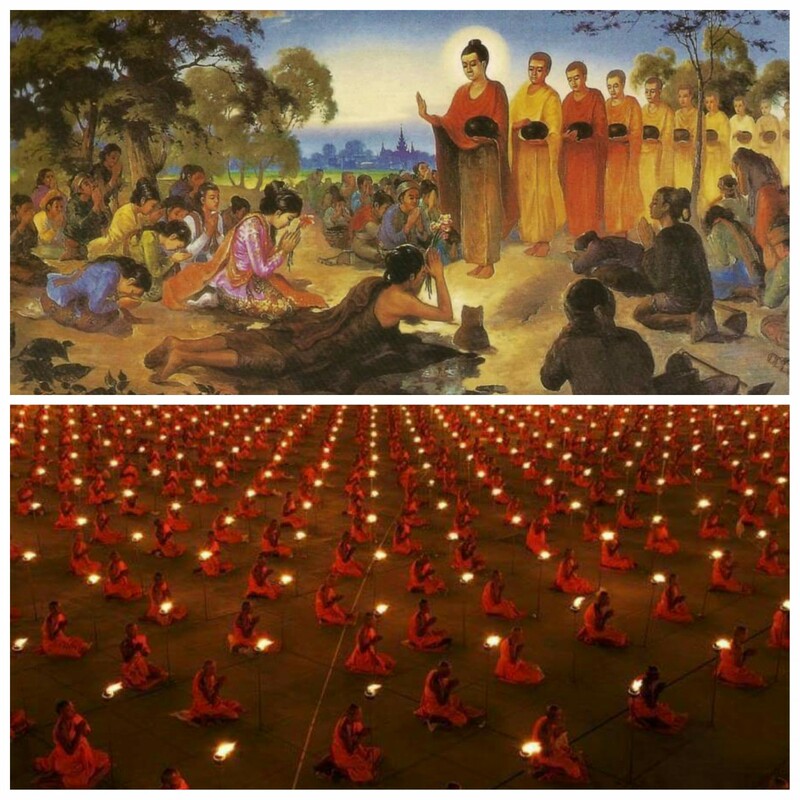 He went to Thailand in 1975, where he stayed for 18 months to practice vipassana and anapanasati in many forest temples and studied with Ajahn Buddhadasa at Wat Swanmokkhaballaram. 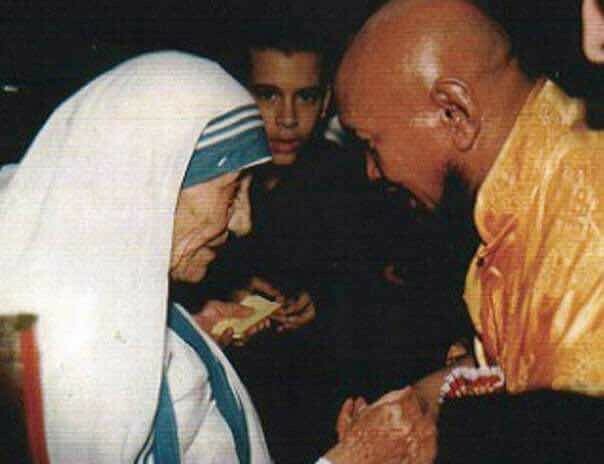 He was then requested by Lama Thubten Yeshe to come to Australia to act as translator for Geshe Thubten Loden. He arrived at Chenrezig Institute for Wisdom Culture in mid-1976. Zasep Rinpoche traveled widely during his three-year stay in Australia, giving Lam Rim meditation courses in Sydney and Melbourne and lectures in Adelaide and Linsmore College, Sydney. Under his direction, Dorje Ling Retreat Centre (now known as Hobart Buddhist Meditation Centre) in Lorinna, and Tenzin Ling Retreat Centre in New South Wales were established. Zasep Rinpoche is also the spiritual head of Tashi Choling Centre in Hobart, Dharma Foundation of Tasmania, Tenzing Ling Centre in Quaama, Lobsang Gyalwa Mandala in Sydney, Tang Soo Tai Martial Arts Centre in Mooroochydore, Queensland and Vajra Ling Centre in Uralla, New South Wales. 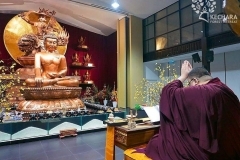 Since 1984, Zasep Rinpoche travels to Australia every second year to give teachings at the various centres. 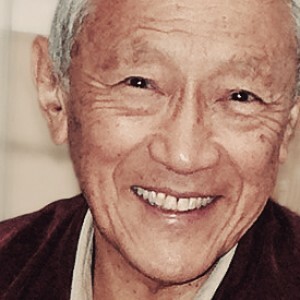 In early 1980, at the invitation of his Canadian students and relatives, Zasep Rinpoche took up residence in Nelson, British Columbia, where he gave a six-week course on the theory and practice of Buddhism at David Thompson University. In the fall of 1980, Kyabje Ling Rinpoche arrived in Toronto at the same time as Zasep Rinpoche and many of Ling Rinpoche’s students requested for his permission and blessings to establish a centre there for the Gelugpas. Ling Rinpoche named the new centre Gaden Choling Mahayana Buddhist Meditation Centre and appointed Zasep Rinpoche as the resident teacher. After establishing the centre, Zasep Rinpoche invited His Holiness Kyabje Zong Rinpoche to teach in Toronto in the spring of 1981. Zong Rinpoche was very pleased about the Dharma activity in Toronto. 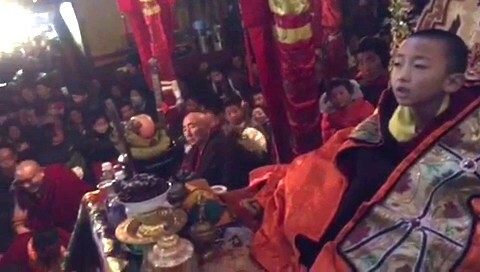 A recent photo of Zasep Rinpoche at Palden Bhairavi Temple. 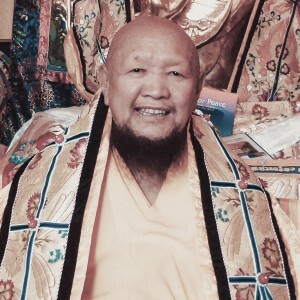 Since then, Zasep Rinpoche has given many teachings at Gaden Choling, including Lam Rim, the Bodhisattvacharyavatara (Shantideva’s Guide to the Bodhisattva’s Way of Life), teachings on death, rebirth and the intermediate state, Buddhist logic and debate, Kalachakra sadhanas, seven-point thought transformation, Mahamudra teachings, and the Four Foundations (ngondro). 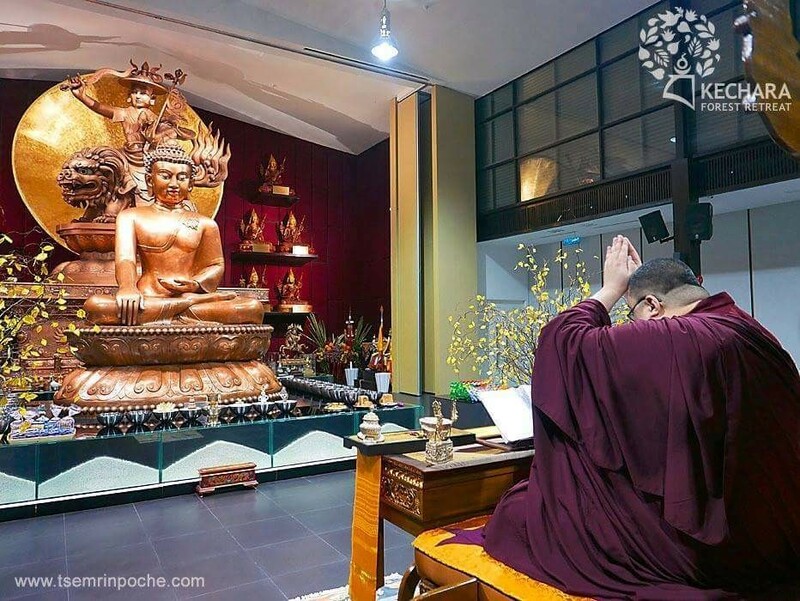 He has also given Chenrezig, Manjushri, Vajrapani, Medicine Buddha, White and Green Tara initiations, White Manjushri, Saraswati, Mahakala, White Dzambala, Vajrasattva, Heruka, Yamantaka, Vajrayogini, and Cittamani Tara many times. He also gave a commentary on the sadhana of Yamantaka, Vajrayogini and Cittamani Tara, led weekend retreats, and has given private teachings for individual students, both formally and informally. 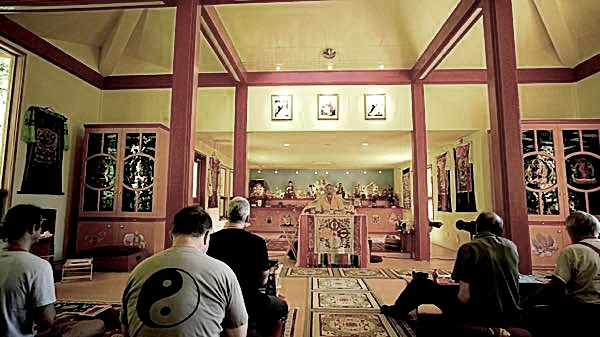 Under the guidance of Zasep Rinpoche, four more Dharma institutions were established around Canada – Tashi Choling in Nelson, Zuru Ling in Vancouver, Cittamani Group in Ottawa, and Potala Centre in Thunder Bay. 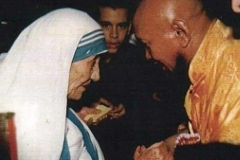 His American students also founded Golden Blue Lotus Tara Center in Moscow, Idaho and Lama Tsong Khapa Center in Kalamazoo, Michigan. 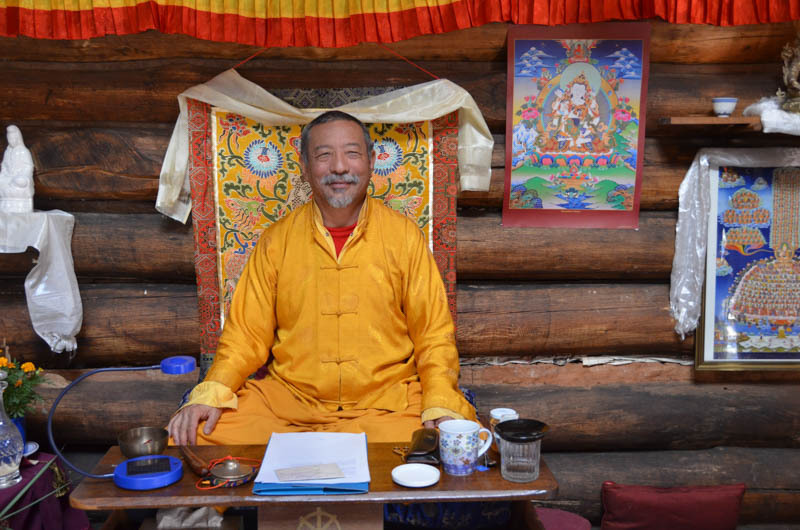 This prolific Lama regularly visits his centres and offers extensive teachings, initiations and retreats all over Canada, America and Australia. He has taught courses at Naropa Institute in Boulder, Colorado on Buddhist logic and debate, Pramanavartika, and Madhyamikavatara during the summers from 1980 to 1982. He has lectured at McMaster University in Hamilton, Ontario and Carleton University in Ottawa, and has twice led two-week retreats at Ainsworth Hot Springs, B.C., on Medicine Buddha and on the Lam Rim. 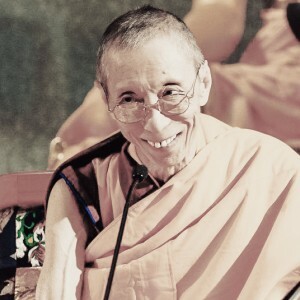 He has also taught the Dharma community in Edmonton, at the Tibetan Buddhist Temple (la Temple Boudhiste Tibetaine) in Montreal, Quebec, at Thubten Dhargye Ling Centre in Los Angeles, at Vajrapani Institute in Santa Cruz and at Milarepa Centre in Vermont as well as in Anchorage, Alaska. Zasep Rinpoche and his students are involved in various levels of spiritual organisation, inviting many high lamas and teachers to Canada and America, such as Venerable Tara Rinpoche, Kyabje Lati Rinpoche, His Holiness the 9th Khalka Jetsun Dampa, the late Serkong Rinpoche and His Holiness the Gaden Tripa. 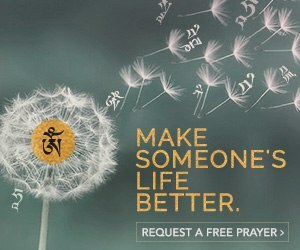 In November 1997, Zasep Rinpoche brought all his centres together in Vancouver for the first Presidents meeting to work together as Gaden for the West, an international organisation created for the express purpose of bringing, interpreting and integrating Gelugpa Tibetan Buddhism to the Western world. Zasep Rinpoche created this vehicle to make Tibetan Buddhism, particularly the Gelugpa lineage, accessible to as many people as possible by utilising teaching methods that are suitable for the Western minds. 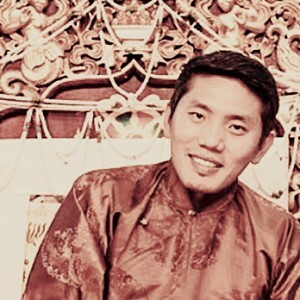 Zasep Rinpoche now resides in Nelson, BC., close to the Gaden for the West retreat centre (Gaden Tashi Choling Retreat). However, Rinpoche is endlessly traveling throughout the year to visit his many centres in the West, re-establish lineages and practice environments at his monasteries in Tibet as well as at several monasteries in Mongolia, leading pilgrimages to the holy sites of Lord Buddha in India, as well as supervise and expand the many projects of his non-profit society, Gaden Relief. It’s amazing how when attained beings are born, the parents receive auspicious sign before, during and after the birth. And, Zasep Rinpoche was no exception. Another amazing thing that I noticed was that he was learning and receiving teachings and transmissions from a very young age. Zasep Rinpoche is so compassionate to rebuild, travel and teach to re-establish lineages and practice environments as well founding Gaden Relief to bring aid to many. May Zasep Rinpoche have long life and stable health to realize his work to spread the dharma to benefit many many more beings. H.E. 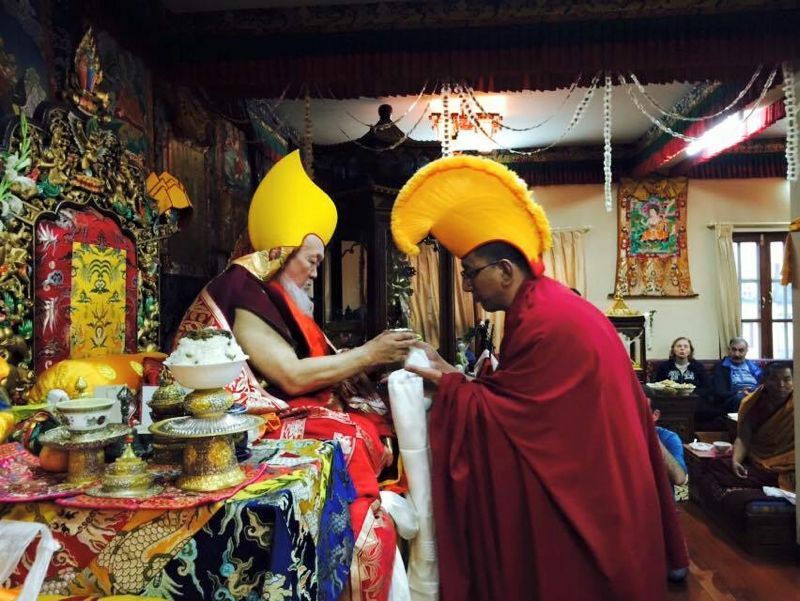 Zasep Tulku Rinpoche was recognized by H.H. 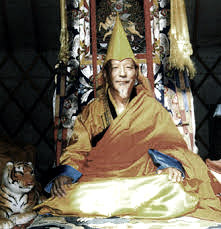 Kyabje Trijang Rinpoche, as the incarnation of Lama Konchog Gyurme. He met Kyabje Trijang Rinpoche again and received getsul (novice monk) ordination from Kyabje Trijang Rinpoche when he was 13 years old. Kyabje Trijang Rinpoche advised him to further his Sutra and Tantra studies with Geshe Thubten Wanggyel. Upon hearing the name of this great teacher, H.E. Zasep Rinpoche felt a great happiness due to the strong karmic connection between them. There was one time H.E. Zasep Tulku Rinpoche was meditating in front of Geshela, he started to nod off to sleep. Geshe Thubten Wanggyel picked up a small mud butter lamp and threw it at Zasep Rinpoche that hit his head and broke into many pieces. Nevertheless, H.E. Zasep Tulku Rinpoche showed his great devotion to his guru and see this wrathful action against him as a blessing and initiation. With his determination and great devotion to his teacher, H.E. Zasep Tulku Rinpoche followed his guru’s advice to complete the studies at Varanasi Sanskrit University and teach dharma to the world especially in Western Countries. Thank you for sharing this courageous and inspiring story of H.E. 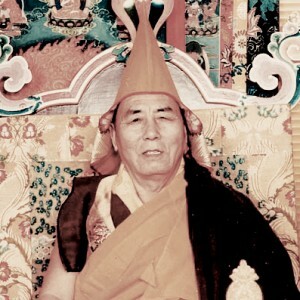 Zasep Tulku Rinpoche.